The Staff very Professional. Clean and Neat Rooms. We stayed here on a night we were visiting LegoLand. It's still about 20 mins away, but the room was clean and we appreciated the Japanese style touches. There are some small shops nearby for extra essentials (snacks, etc.) and the room was quiet and comfortable. The Staff is always friendly and the place feels like a wellness spa right from the get go. There is a peaceful, serene atmosphere from the first them into the premises and the lodging is second to non! Ample parking spots are available and the internet is strong, so this is just a heavenly location! We were able to save a lot because it was Ramadan season where prices are low. We booked for 2 nights to check if the place is ok & requested for an extension with a discount for an extended stay. They gave us the same rate with agoda promo rate. All the staff are awesome esp the Filipino receptionists. Very quick to respond to all your needs. The location is also wonderful, everything is just accessible within reach. And the room was perfectly wonderful. I just wish they have a lower rate than the lowest they have during regular seasons coz i wud definitely keep coming back. Rooms are well decorated, spacious. Lots of little accessories, great wifi, friendly staff. Great value! Theres even a Japanese style bathtub on the 6th floor, though it operates on a limited schedule. Far from City and walking distance to Batuta mall is about 15mins walk. Do not recommend to walk at night as it was dark. Bring your own towel as they provide old towel. WE requested to check out at 1pm but was rejected. Only 1 only extension but was also rejected. No bell boy or staff helping you to get the taxi to the airport. You need to bring all your luggage the opposite of the road to get taxi. You need to give them the exact time to pick your luggage or else they will not keep it for you. I say its a spot on location it you just wanna go to ibn battuta otherwise you be waisting time going to anywhere else in dubai. They used Japanese touch to give it w feeling but you can't claim 4 starts if you have no pool or your gym is deep into basement carpark with weak ventilation. I was happy with staff and room size as I got upgraded to 1br, and I should say if u got ng with family, they have almost the most kitchen accessories for you so you won't feel its a hotel kitchen. Cleaners should put their socks into it though, not serious enough I'd say. During my recent tour to Dubai I stayed at 4 different 3 stars hotels and this one was the best and the cheapest one at the same time. The thing I liked most about the hotel was its staff who would go out of the way to help you out. The environment is very friendly. There is a super market at ground floor and some arabic/labenese food options around the hotel. They gave me early checkin and free upgrade to one bed apartment. The only thing I do not like about the hotel is its location i.e. it is too far from the city plus I had to use taxi to reach metro station. Actual fare from the hotel to metro was 8 aed but their minimum fare is 12 aed. The fare from metro to the hotel was like 10-11 aed. 1. The breakfast, although it was kind of pricey. 2. The in room kitchen and washing machine were a MAJOR plus! 3. The staff was always very courteous and helpful. Overall it was good. The only issue I had was with the Internet codes you held on to for some reason. I would get cut off in the middle of work and have to wait hours to get reconnected. Then wait a day for new codes! A couple of times having to re-do work I had already started. If your concern is Internet piracy, there has to be a better way for your customers to have good stong internet connections throughout their stay WITHOUT interruptions! 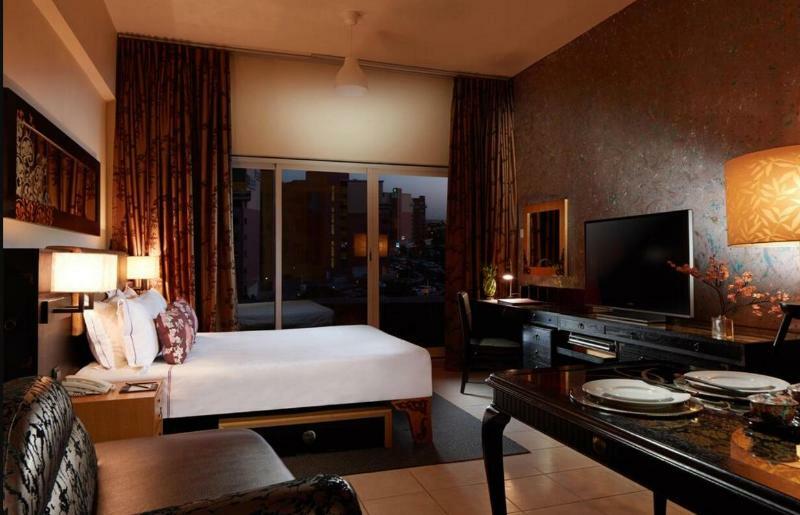 The room is very clean and spacious, and the hotel is well situated with convenient stores and shops close by. 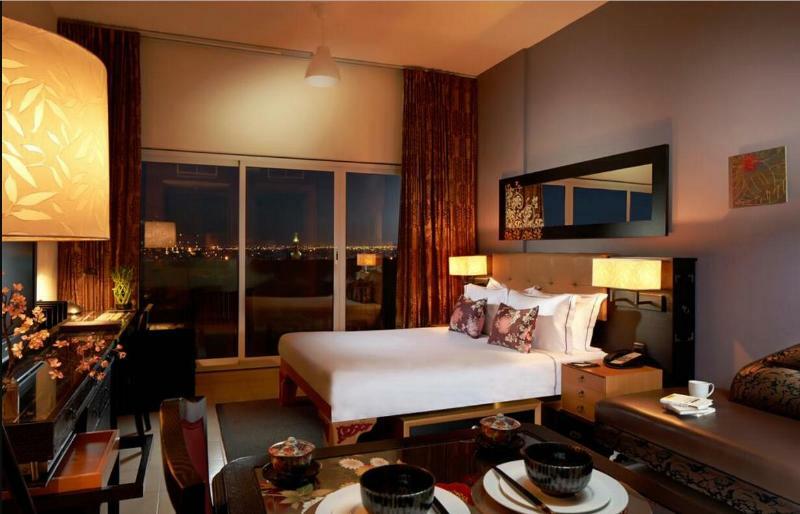 It has easy access to Jebel Ali area and Sheikh Zayed Road. The hotel has a Japanese bath for guests to relax in after a day's work. The worst part was the rock hard bed, it would have been more comfortable to sleep on the floor, it felt like a concrete slab, they came and added an extra mattress but hardly made a difference, the hotel was very very different to how lovely the pictures looked online, there were even cockroaches on my toothpaste one morning, I really don’t think this was good value for money as I went across to another 3 star hotel which was amazing and leaps better. Staffs are very helpful and courteous. Spacious room w/ many appliances. comfortable stay. you get the value for your money! It is clean, complete facilities, perfect for long stay and friendly staff. location is good as well. More comfortable about location and cleanliness .im regular quest here but this time a bit upset about the room ..coz too small more than I expected.. i booked for 40 square meter but this room maximum only 25 square meter..but thank you very much for late check out. 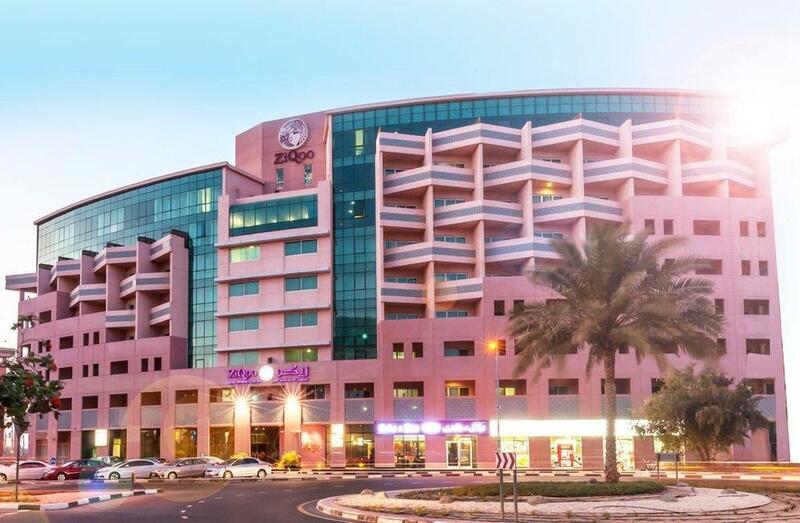 I chose this hotel because of its convenient location near Jebal Ali in Dubai (15 minutes drive). The receptionist welcomed we and gave me a complimentary upgrade which was sweet of them. The suite was spacious and fully equipped. The hotel does not have much facilities inside. However outside there are plenty of restaurants, supermarkets, laundry, etc. Ibn Batuta mall is 5 minutes away by car too. I recommend staying in this hotel. Decent place to spend the night. In the middle of a residential area, so no great views from the room but is in close proximity to supermarkets and lots of restaurants. The hotel parking is very far and is at the backside of the complex and the parking in front of the hotel is never available. The entrance is a little disorientingly dark with the japanese theme settles in a while later. Close to Ibn battuta. Discovery Gardens is really far from Dubai, and there is only one access road. So it's packed during rush hours. The hotel is ok, personnel is nice, the rooms (apartments are large, the kitchen is well equipped. Haven't had the chance to visit the SPA. Once the road issues behind, Discovery Gardens appears to be a nice place. Nice and price-value restaurants, supermarkets, pedestrian areas. Very close to Ibn Batuta shopping mall. If you work in the Jebel Ali region, I'd recommend ZiQoo. สถานีรถไฟใต้ดิน Nakheel Harbor and Tower - ระยะ 0.98 กม.